The royal wedding was always going to lead to copycat wedding dresses and cake replicas - even if not all happy couples have the royal budget to match. 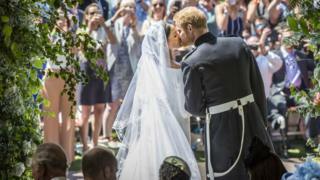 More than one month on from the Duke and Duchess of Sussex nuptials, wedding planners and industry experts say the impact is far-reaching - and some brides agree. Bride-to-be Ceriann August, from Aberdare in south Wales, said she had planned a gothic-style wedding but is now opting for a cream dress with a 3ft train, cathedral veil and an "English rose" make-up look after seeing Meghan. "My picture board was all finished and I was ready to start ordering, then I watched the royal wedding," said Ms August, who will marry fiancé William in September. "I changed my wedding colours after loving her flowers. Her wedding oozed class and inspired me to go with nature." Meanwhile, engaged Hayley Smith, 29, from west London, said she was inspired by the duchess' Givenchy gown. "I loved the shape of the dress," she said. "I loved the long sleeves and would love to pair this with my own style. "And it has made me think twice about wearing a veil as it looked stunning. I was never going to wear one." Couture bridal designer Phillipa Lepley predicts the trend for simpler, more classic styles - inspired by the duchess' pure white, boat neck dress - will begin at the start of next season. "I think it will make people braver to wear a clean dress," she said. And there are likely to be direct copies of the dress and the embroidered cathedral veil, Ms Lepley added. Bernadette Chapman, from the UK Alliance of Wedding Planners, said their members are seeing brides choosing a cathedral veil, buying a second outfit for the evening reception and asking for the same lemon and elderflower cake. Company Richard Designs has created a royal wedding inspired-veil with embroidery and lace appliqués for "the light, floral effect that Meghan chose" - adding that it has proven popular with stockists. According to Google Trends, total search interest for "boat neck" clothing increased by 269% in the week after the wedding, compared to the week before - and even search interest in well-established fashion house Givenchy rose by 43%. Google searches for Stella McCartney, who designed the duchess' halter-neck evening dress, increased by 139% in the week after the wedding, while wedding planning app Bridebook also saw a 160% rise in searches of the British designer's name. Emma Meek, the head of a luxury bridal boutique, said the duchess' "preppy, presidential wife-style" dress "channelled the zeitgeist of a certain type of professional woman who has enough confidence with that level of simplicity". She said that it was a "strong look" often requested by her brides - but added that it differs regionally, and in some areas the simpler look may become more popular. Micky Bruschini, the manager of a bridal shop in south west London, agrees that plainer style dresses "are becoming more fashionable". But she adds: "I do think that a lot of brides weren't amazed by it and were a little bit underwhelmed. It didn't have the same reaction as Kate's dress. I have not had anyone asking for something similar [to Meghan's]". However, the Stella McCartney dress is a "big fashion trend in bridal and it started this year," Ms Bruschini added. Florist Katie-Jane Hermes, who is based in the north-east of England, said she "quickly noticed changes in customer requests" following the Windsor wedding. "I've found that brides-to-be are requesting arrangements with a lot more foliage to mimic Meghan's bouquet," she said. And bride-to-be Katie Elizabeth Chadburn said that although the royal wedding "didn't really have an impact particularly", she and her fiancé will hand-pick their flowers the day before their wedding, as Prince Harry did. According to Google, even search interest in "bowl food" - which was served to the Duke and Duchess' guests - rocketed by 121% following in the first week of June compared to the start of May. Searches for "gospel choir" also soared to nearly 300% higher. It is difficult to know for sure whether many of the features that brides and grooms are adopting are directly sparked by Harry and Meghan - or whether the royal couple tapped into current wedding trends. Zoë Binning, a wedding planner in south and west Wales, says the Duke and Duchess of Sussex have helped to cement a growing trend in the UK for less traditional weddings. "I have noticed a massive shift in people feeling free to do it their own way. Not feeling they have to have the standard top table or the bridesmaids. "A lot of people will look at [Meghan] and think if she can do that I can do that. "Whilst they obviously had to maintain a certain level of formality, it was also their wedding and that made it really, really special," Ms Binning added. Hamish Shephard, who founded and runs a wedding planning app, agrees. "The huge trend happening in the wedding industry, but it's now been given the royal seal of approval: personalisation." "Her breaking a few barriers and saying I'm going to walk down the aisle by myself. "27% of brides [on our app] are planning to do a speech themselves. Meghan did one on the most formal occasion ever. There's a huge sense of empowerment. "And there was a 34% rise in searches for a non-traditional wedding cake," he added. Bride-to-be Ms Smith, whose father will not be walking her down the aisle at her wedding in 2020, called the duchess' decision to partly walk alone to the altar as "groundbreaking", adding that she thinks it will "make brides feel better or make them realise they have other options". She added that she and fiancé Marcus were inspired by the less traditional portraits taken of the royal couple, adding: "We much prefer more relaxed, natural photos, so this is something we will be adopting," she said. 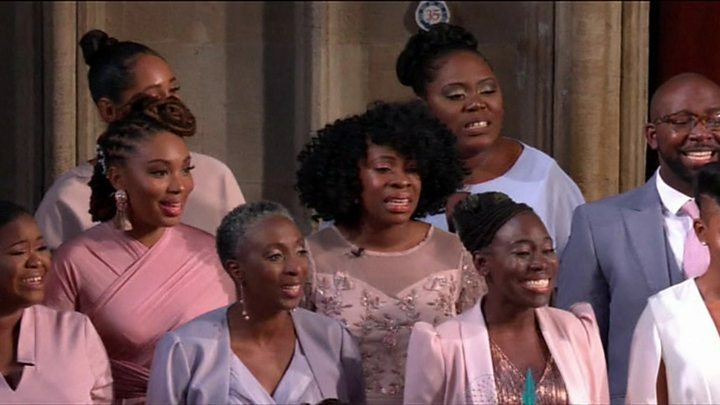 Ms Chapman, director of the UK Alliance of Wedding Planners, said the duchess walking down the aisle alone was "a powerful message to all women out there". Meanwhile, bride-to-be Hayley Russon, who lost her own mother eight years ago, said the ways Prince Harry commemorated his mother Princess Diana struck a chord with her. "I thought the lovely little details that he incorporated into the wedding were so special," she said. "Although I didn't necessarily get any new ideas it made me feel that it's accepted as a nice thing, rather than something people wanted to overlook for a wedding," she said. But the trend towards hosting more personal weddings is also being cited as a reason why many brides and grooms say the royal wedding is irrelevant to their event. "My wedding is my own, it's based upon the interests and likes of my partner and I," said Bethany, 27, from Salisbury. "It's not based around the royals, celebrities or our friends' weddings, as it is ours." And Kathryn Ann Moore agreed, adding: "No impact, to be honest. Each individual's wedding is different. "I cannot see how it would impact on anyone else's wedding as those personal touches are exactly that."